Women’s Basketball: The Terriers have dropped their second consecutive game, losing in overtime today to the Central Connecticut State Blue Devils 71-66. The Terriers came into this afternoon’s matchup looking to right the ship, as they have dropped two out of the last three ball games. They would fail to do so as they lost this one in overtime, dropping their record to (13-5, 4-3 NEC). This matchup went back and forth throughout regulation and into overtime, as neither team seemed to be able to take control of this one out of the gates. There were a total of 12 lead changes and 9 ties, throughout this seesaw affair, until the Blue Devils were finally able to pull away in overtime. The Blue Devils were able to dominant the battle for the boards, as they out rebounded the Terriers 44-30. Half of the Blue Devils rebounds came on the offensive glass. This proved to be key as their second chance opportunities eventually propelled them to victory. They were led by Senior guard Jessica Babe who had a very solid ball game. Babe scored 20 points shooting an efficient 7-12 from the field, to go along with her 20 points she was able to grab 4 rebounds, dish out 3 assists and swipe 4 steals on the afternoon. Blue Devils Sophomore forward TeJahne Malone was also able to put together a nice little game of her own today. Malone who did most of her damage from the free throw line, scored 13 points on 2-8 shooting from the field, but shot 9-11 from the frow throw line. Malone pulled down a total of 7 rebounds all of which were offensive boards, which proved to be a key to victory for the Blue Devils on this day. To go along with the great play of Babe and Malone, the Blue Devils got some real quality play off of their bench. Their bench scored a total of 24 points on the afternoon. 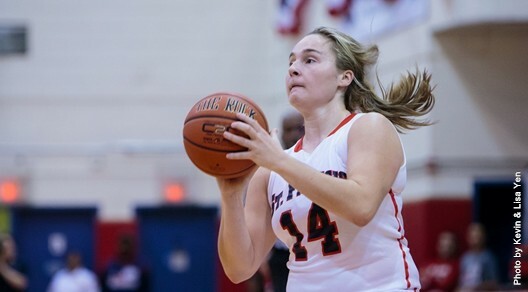 They received a boost from Sophomore forward Nicole Ferguson who scored 11 points in 17 minutes off the bench. The Terriers who came out on the short end of this one, were led once again by Junior guard Eilidh Simpson who scored a game high 22 points on 9-15 shooting. Simpson was able to score early and often in this affair, but what really plagued her along with the rest of the team was turnovers. Simpson turned the ball over a total of 7 times on the day. As a team the Terriers turned it over 21 times which is far too many. Senior guard Jasmin Robinson had a nice game for the Terriers off the bench as she scored 11 points in 19 minutes of play. The Terriers had a couple of their key players go quiet in this afternoons defeat. Sophomore guard Leah Fechko scored only 6 points shooting 1-6 from the field and Junior forward Sarah Benedetti scored 5 points shooting 1-7 from the field. Both players are key contributors to what the Terriers have accomplished all season long. It is tough for the team to be successful with both of these outstanding players having off games. On the defensive end of the ball the Terriers were able to force 22 turnovers which is great, but they were not able to capitalize on them. A team who turns the ball over 22 times has no busniess winning a ball game. The Terriers let them off the hook by turning the ball over 21 times themselves. We have seen the first rough patch of the season from the Terriers who started the season 12-2. This rough patch came at the wrong time as they have dropped three games against conference opponents. They do hold the best overall record in the NEC at 13-5, but with their conference record at 4-3 it drops them to 4th place within the conference. The Terriers are back in action on Monday January 27th at home, where they take on the Wagner Seahawks at 7 PM. The Terriers can’t wait to get back onto their home court as they are 7-0 in games played at the Pope Physical Education Center. They will look to get back on the right track and continue their home cooking with a much needed victory.